Somewhere towards the end of multi-day walks, I usually find fatigue and fitness intersecting. They are uneasy acquaintences, eyeing each other with ill-disguised suspicion. Each perches on a shoulder, leans into an ear, makes its case. Fatigue is a whinger, whining at me to simply stop walking; to take off my pack, get myself clean, eat some yummy food, sleep in a comfy bed. The whinger, in short, is telling me it’s time to be a normal, sensible human again. And walking for several hours a day, through rugged terrain in all weathers, carrying everything on your back, is neither normal nor sensible. Fitness whistles a happier tune, telling me how great I feel, willing me to ignore minor aches and pains, suggesting I consider other wondrous things I can do now that my body is attuned to hard work. The whistler wants to show me that it’s possible to transcend the ordinary; that mere walking can take me to great heights, literally as well as metaphorically. 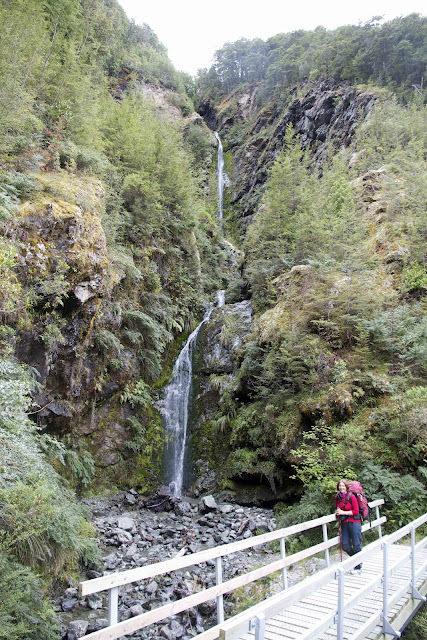 At the start of our final day on the Greenstone/Caples Track, the whinger was well and truly on the back foot. We’d had a brilliant time in the Greenstone Hut, literally basking in the glow of the afternoon and evening sun. And then the stars – one, a few, a multitude – had come out to remind us we’re not alone. And when the morning began fine and clear, and our packs went on lighter and more easily than on any other day, we were close to whistling. But bushwalking rarely stays easy. Even as we moved swiftly down the beautiful Greenstone Valley, through every-varying forest, fatigue trudged behind, ready to overtake us. Sometimes it only takes a brief stop, say for scroggin and water, for your rhythm and energy levels to be upset. Suddenly your body remembers what you’ve been putting it through, and the whinger has your ear again. Thankfully at such times even the whinger agrees that there’s only one solution. You walk on. 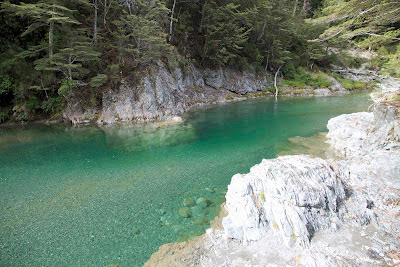 And so we did, getting our “legs” back again, marvelling at the Greenstone River, now tearing along, now tranquil, always stunningly coloured. Although its waters are almost green, its name is derived from the pounamu or greenstone (New Zealand jade) that is found in its upper reaches. It was a reminder that we were walking where Maori jade traders walked for centuries. One of the day’s landmarks was the oddly named Slip Flat. We’d been seeing obvious signs of cattle on the track, both hoof marks and cow pats. Treading in one of the latter would have made it easy to do exactly what the place name said. But as we approached the place we saw a more obvious reason for the name. 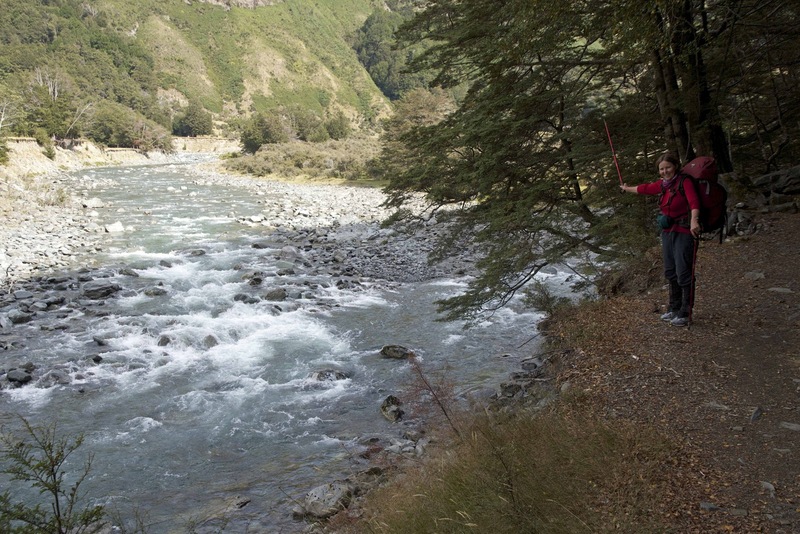 Across the river was a very large landslip, with a huge volume of rock spread over a long, mainly vertical, distance. The flat itself is not – not flat, that is. But it’s all relative in this deeply enclosed valley. The steep sidling of the last hour eased off, and we were now in partially open pasture. Here we met the cattle we’d been following: a mother, calf and a young steer. They stared at us in that intensely inquisitive way that only cattle seem capable of. If they also displayed just a hint of readiness to turn and flee, it was overmastered by their curiosity. Beyond the flat we returned to more steeply forested slopes, the Greenstone Valley gorge-like again. But we were heading downstream, going with the flow, and our bodies were feeling as fit as they would on this entire walk. If the whinger is pushy, the whistler is also capable of being assertive. For most of the walk we had barely kept up with the Department of Conservation’s slow estimates for walking times. Now, the whistler was hinting, we could show DoC a thing or two! Amazingly, we did just that, getting back to the carpark in just over the shorter of DoC’s 3-5 hours. Although we recognised this as the “horse headed for home” effect, we were nonetheless pleased with ourselves. Sandflies tend to curtail any outdoor celebration in these parts. So we took ourselves back to our accommodation at Kinloch Lodge, and indulged in all those things the whinger had nagged us about, even dunking ourselves in the outdoor hot tub. Occasionally it’s good to let the whinger have his way. Soon enough we’d be plotting the next walk.